If you are gearing up for Ostara, then you are readying for a time of year in which many Wiccans and Pagans choose to celebrate the balance of light and dark that heralds the beginning of spring. It is a time to celebrate new life and rebirth—not only the physical embodiment of renewal but the spiritual as well. To get your altar ready to welcome the spring equinox, try some—or all—of these ideas to mark the changing seasons. To get an idea of what colors are appropriate for spring, all you really have to do is look outside. Decorate your altar in any of these colors. Notice the yellows of the forsythia blooming behind your house, the pale purples of lilacs in the garden, and the green of new leaves appearing in the melting snow. Pastels are often considered spring colors as well, so feel free to add some pinks and blues into the mix. You can try a pale green altar cloth with some purples and blues draped across it and add some yellow or pink candles. Altar decor can reflect the theme of the sabbat. Ostara is a time of balance between light and dark, so symbols of this polarity can be used. Use a god and goddess statue, a white candle and a black one, a sun and moon, or you can use a yin and yang symbol. 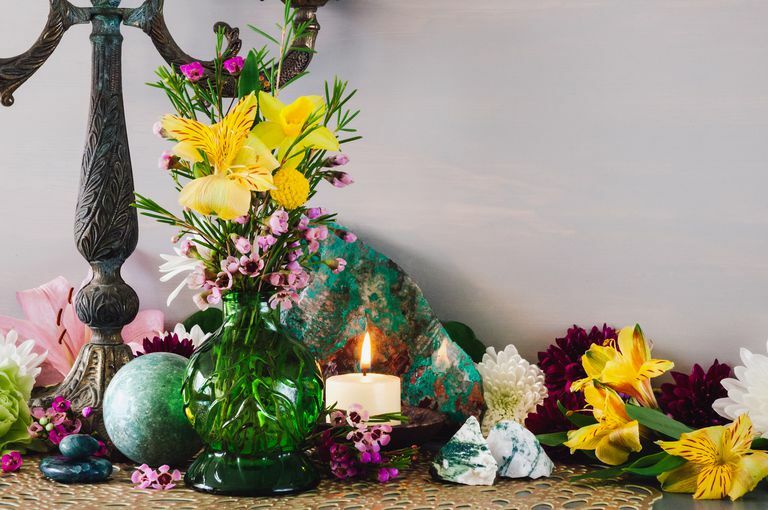 Since Ostara is also a time of new growth and life, you can add potted plants such as new crocuses, daffodils, lilies, and other magical spring flowers to your altar. This is the time of year when animals are bringing forth new life too. You can put a basket of eggs on your altar, or figures of new lambs, rabbits, and calves. You might want to add a chalice of milk or honey. The milk represents the lactating animals who have just given birth, and honey is long known as a symbol of abundance. There are a number of other symbols that signify the season including insects undergoing transformation or bees busy harvesting honey. Nature deities play a prominent part in the season, too.